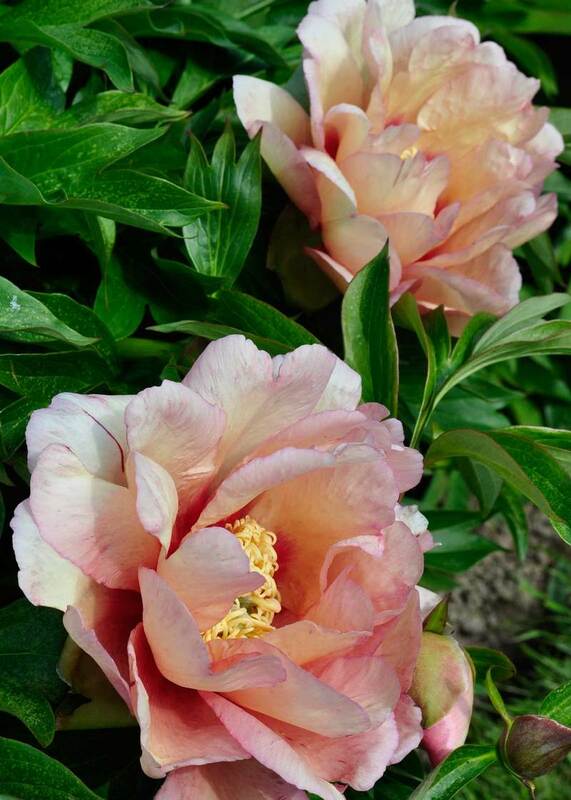 Of the different types of peonies, Intersectional Peonies have the best characteristics of all. The flowers and foliage are in perfect proportion to one another, taking the best from each of the parents, the tree (woody) and herbaceous peony. 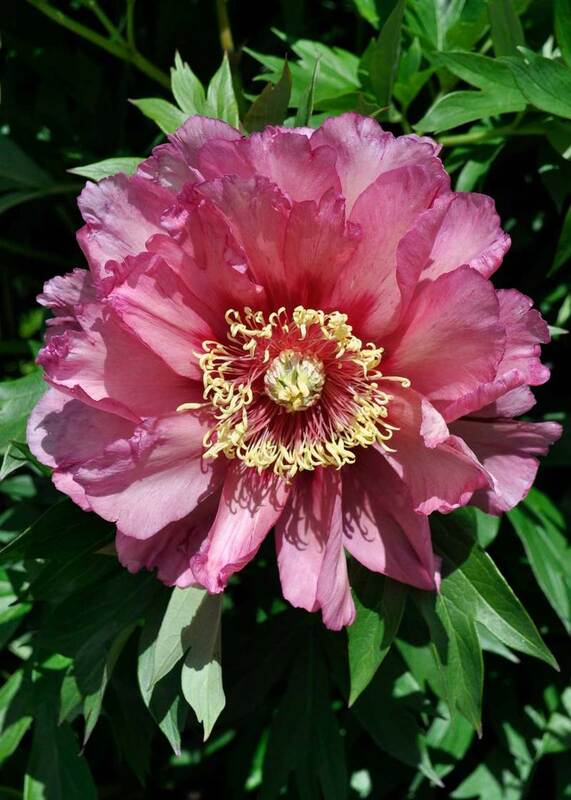 They bloom same time as herbaceous peonies from early to late June, but because they have so many buds they in bloom for longer, for up to 3 weeks or more. The flowers are big, and generally semi-double. They open from large, beautifully shaped buds into deep bowls that loosen as the flower ages. The blooms are sterile, which means they do not produce seed, but the large furry seedpods, despite being empty of seeds, are very attractive. At night each flower closes up for protection helping it to last longer. A bloom can last as long as 5 days, and many lower side buds. 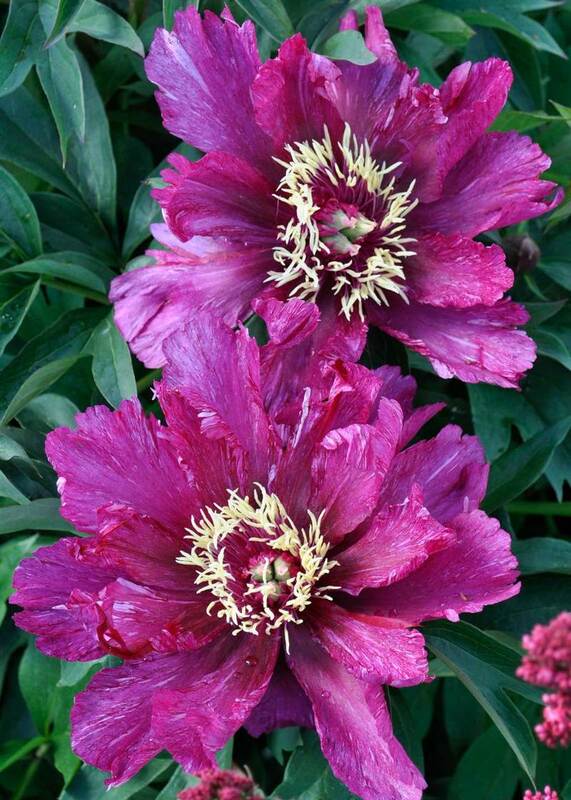 Overall an Intersectional peony can be in flower for up to 4 weeks, some 2 weeks longer than other types of peonies. I have also found a few varieties, such as P. ‘Bartzella’ producing the odd flower in autumn. In shape and growth Intersectional peonies look more like an herbaceous peony than a tree peony. Short in stature, most varieties form a dense mound. The leaves are large, leathery, deeply divided and glossy or mat in texture. They are carried on smooth woody stems and in autumn, long after the leaves of herbaceous peonies have shrivelled into a crumpled mess, they turn red then simply and elegantly drop off. I have yet to see any disease, including Peony Wilt, on any of the varieties we grow. 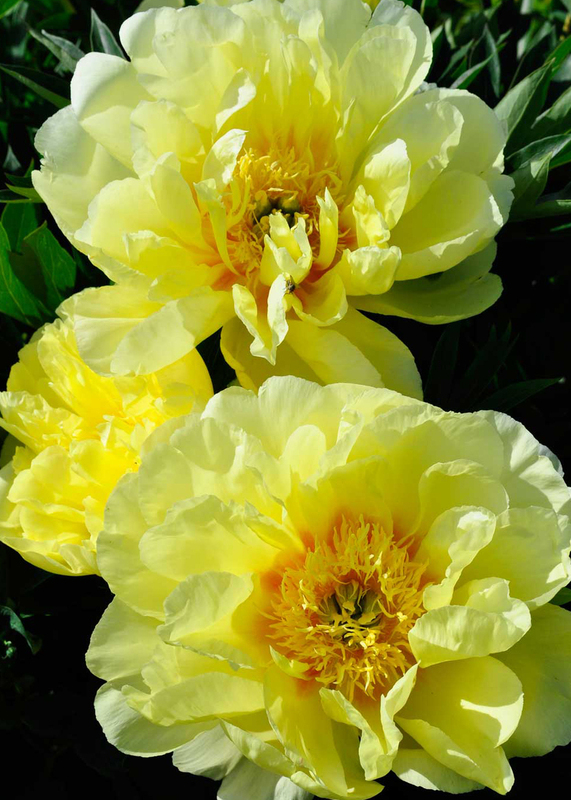 Until recently the only peonies to produce yellow flowers were those of woody tree peonies, such as Paeonia lutea, or the fleetingly beautiful herbaceous peony P. mlokosewitschii. 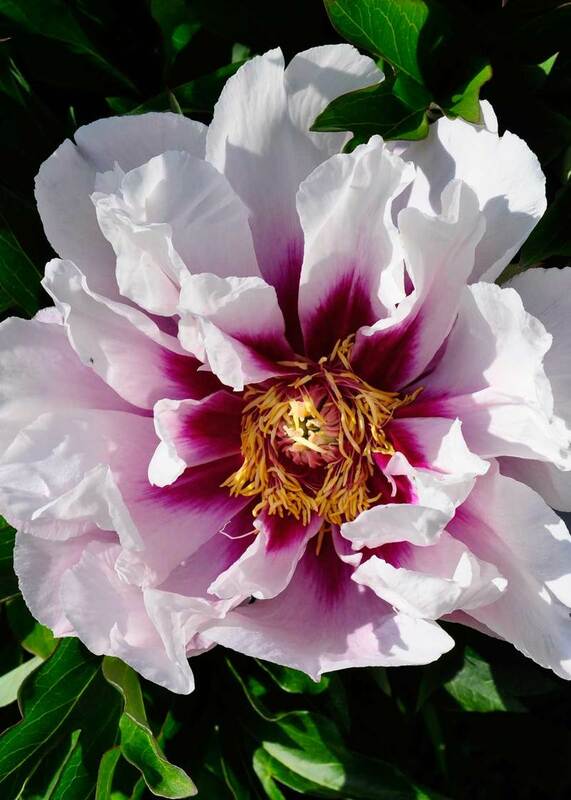 In the early years of the 19th century Japan’s Dr. Tiochi Itoh began working to change this by crossing the two types of peonies, herbaceous and tree. 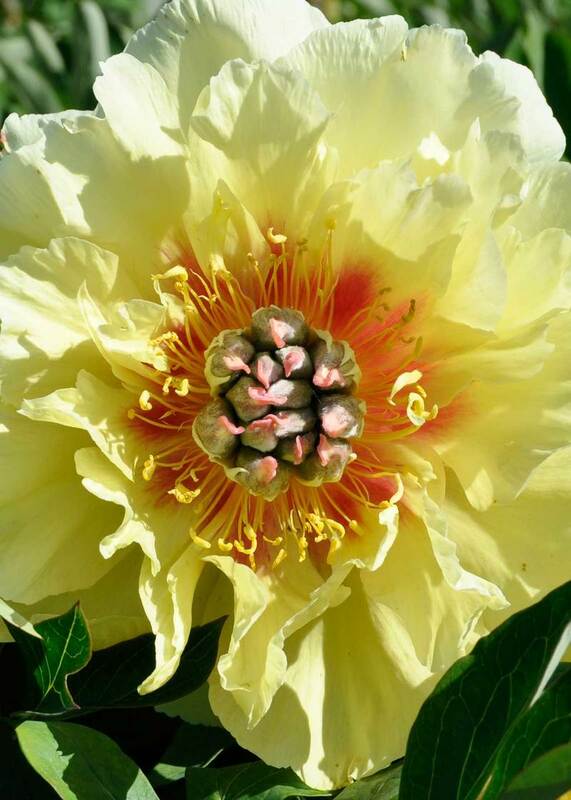 His aim was to create a truly yellow, double-flowered herbaceous peony. Eventually after thousands of crosses he raised just 36 yellow seedlings. In 1964 these bloomed yellow and double, but sadly Dr. Itoh never saw his achievement as be died in 1956. However, he must have realised that his creations were entirely unique. In appearance they grew like herbaceous peonies, short and mounding, but they also had short woody, tree peony-like stems. His plants did not disappear as they were taken to America, where in 1974 six were introduced with names like ‘Yellow Crown’ and ‘Yellow Emperor’. 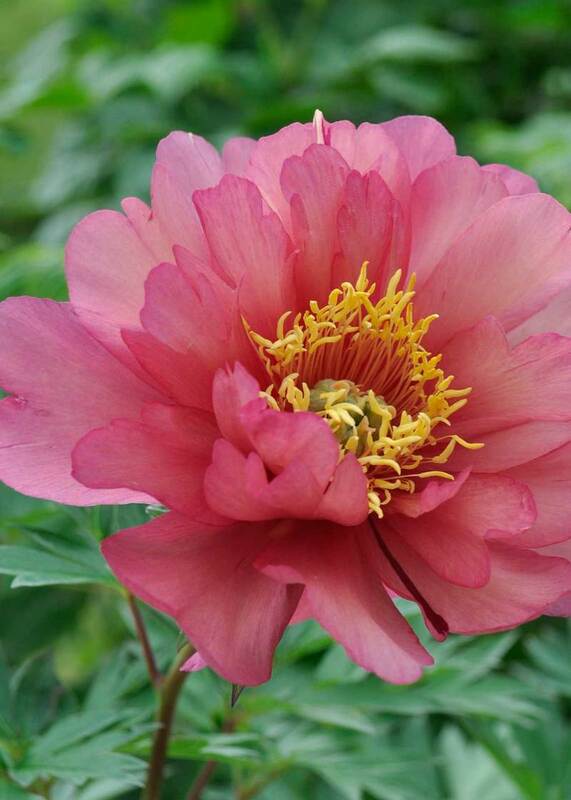 A new peony group was named Itoh Peonies after its creator, but as more varieties have appeared the name has been superseded by Intersectional peony. The first Intersectional peonies I acquired in the late 1980’s where the ‘Yellow’ series. These didn’t grow well. 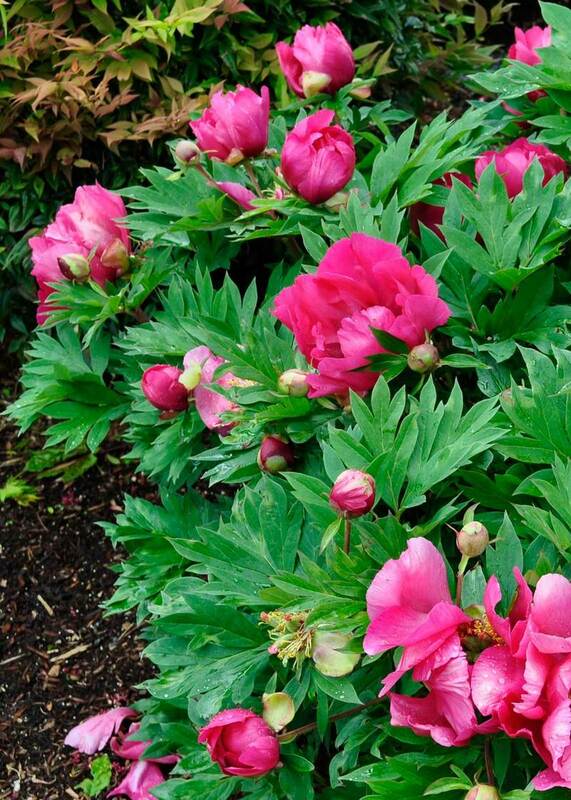 They are short and stumpy with Japanese tree peony-like leaves and downward facing flowers. In 2001 Don Hollingworth, based in the US, sent me a specimen of Paeonia ‘Garden Treasure’. It arrived looking like a twig, but much to my astonishment two years later the plant had grown into a glorious mound topped with 13 beautiful big, semi-double, lemon-yellow flowers. This convinced me that Intersectional peonies would be the future of peonies. Today Intersectional peonies can be found in a wider range of colours than other peony group. Ranging from red, pink, apricot, yellow and white, some start one colour and morph to another. However, because they are still reasonably new, most are quite expensive. 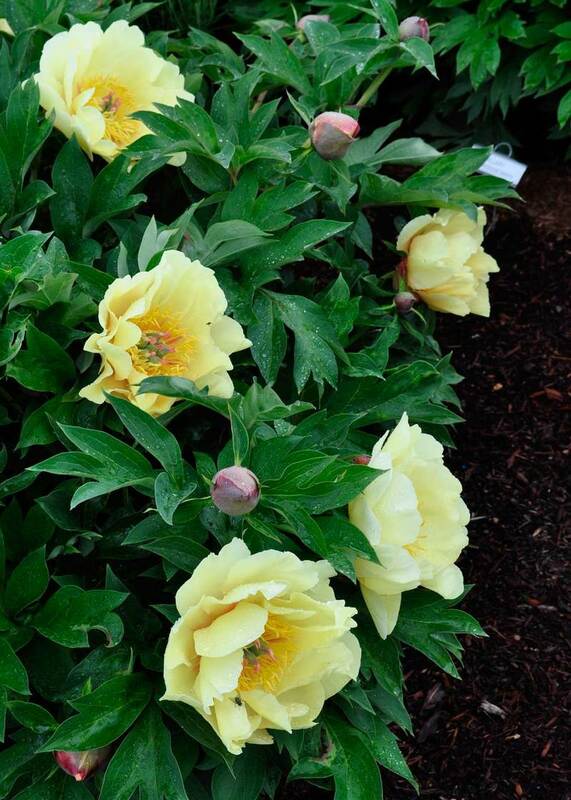 Intersectional peonies will grow in the same conditions as herbaceous and tree peonies, a well-drained soil that ranges from neutral to slightly acid. They prefer full sun, but will grow in a situation that has a little shade for part of the day. They can be grown in pots, but the pot must be very big, also you must water the plant in spring so that the buds swell sufficiently to open. Most Intersectional peonies are sold as bare rooted plants. This needs to be placed in the ground with the red eyes (leaf buds) no more than 5cm below the soil surface. Dividing: no, unless they get too big. To do this lift with a good spade or fork and divide using a saw to cut through the crown. Autumn/spring jobs: In autumn unlike most peonies, the leaves simply and neatly drop off the plant revealing the woody stems. Depending on whether they produce new red leaf buds in spring or not, I cut the dead woody growth back to the ground. If there are new buds on the stem, I cut the stems back to these swelling bud as I’ve discovered in some years they are capable of producing a few flowers not just in June, but in early autumn.